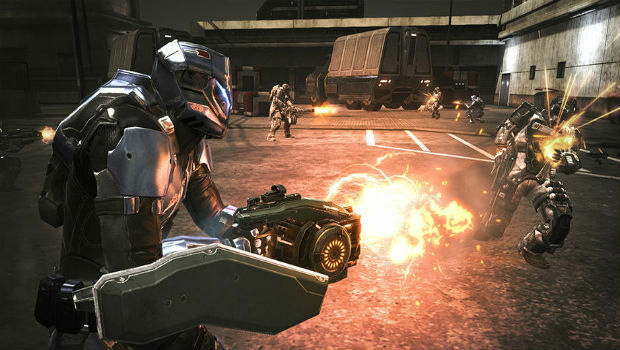 Dust 514 is one of the most ambitious games of all time. Not content with just offering a shooter within the EVE Online universe, CCP Games seeks to actually connect the game to EVE itself, allowing both titles to influence each other in a huge way. It's a major undertaking, and something that was immediately noticed from the very start of the project -- if successful, it could very well change the way we look at gaming. There's only one problem: it needs a ton of work before it gets there. 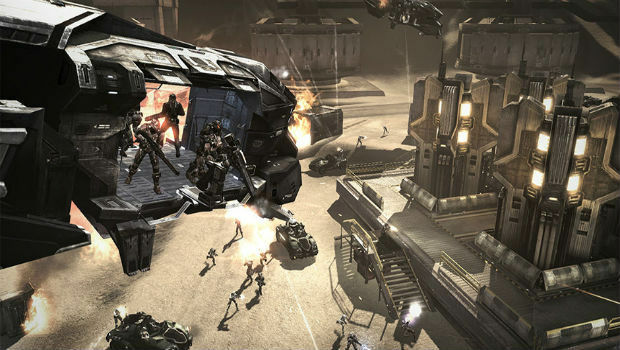 The major draw of Dust 514 is the link between it and EVE Online. It's not just a nominal link either -- usernames span both games, so if your name is taken in EVE, you cannot use it in Dust; this is done so you can connect to both games seamlessly. 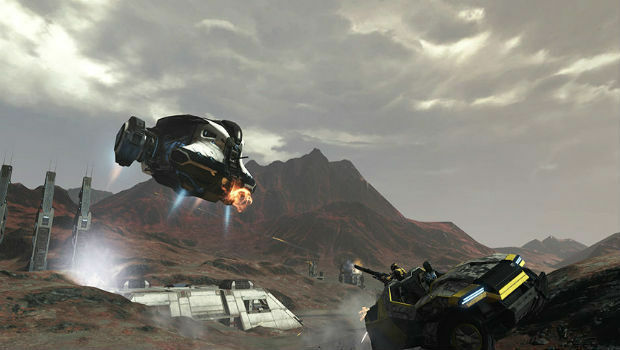 Factional warfare in Dust changes the way EVE players experience the game, and conversely, EVE creates contracts (missions and parameters) in Dust. 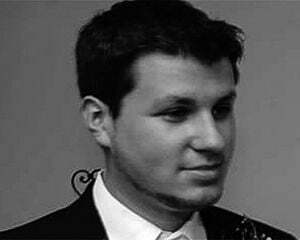 PC EVE players can order orbital bombardments against PS3 Dust players, and so on. It's all very well thought out, and will easily be more appealing if you team up with one of your friends who plays EVE if you're not into MMOs. I've been playing EVE casually for many years, and from what I can tell from the community, nearly everyone is really excited for the project. Simply put, EVE Online is one of the greatest communities I've ever been a part of. Its fanbase is so passionate that many corporations (guilds) have already dove headfirst into the game, offering up training for new recruits who only want to play Dust 514, which in turns reaps benefits for their corporations. If you've been on the Internet since the dawn of EVE, you'll recall some of the craziest stories ever told in the history of gaming -- all of that due in part to the passion of the fanbase. It's a weird meta-aspect that you'll have a chance to embrace, and something you don't see often. But for everyone else who is not already an EVE fan, you're going to see it as another first-person-shooter -- and it will most likely not blow you away. In fact, as soon as I actually booted up my first skirmish, I was immediately underwhelmed. The environments, the guns, the visuals -- everything but the stylized character models was extremely basic, to the point where at times, it looks like a previous-generation title. I experienced major framerate issues, so much so that it affected my ability to see vehicles in the distance. At times, the game seemed to run well below 30 frames per second. I also experienced a decent amount of lag during my time with Dust, which is obviously a problem with an FPS, especially if you're fond of long-range combat. Another issue is the lack of innovative modes within the confines of Dust. Right now, there's only four basic gametypes for skirmishes, and they're basically rips of Call of Duty and Battlefield. There's team deathmatch, team deathmatch with power-ups, and two "capture the point" games (one involves multiple points, the other involves a single point). If there isn't a campaign going on relating to your faction in a cross-EVE event, you're going to have to stick to skirmishes to rack up experience and ISK (more on that later), and after a while, it can get pretty boring. When the game works though, it works about as well as a basic FPS should. If you opt to play with friends -- which should be easy since the game is free -- and stay in squads, Dust is infinitely more fun; tactical combat is much more effective here than random lone-wolf strikes. It won't blow you away in the sense that at a base level, it's all stuff you've seen before, but the more you're willing to get into the meta aspect of the universe the more fun you'll have with it. The map is incredibly intuitive, showing all the action on-screen, all the way up to available spawn-points, heavy artillery fire, and known enemy locations. Gunplay is pretty generic until you get to the later weapons, but when you're not fighting the syrupy framerate or lag, it works. The feeling of success and triumph when you storm an enemy base are all there, as are those crucial moments when you ram one of your vehicles into a group of enemies and mop up the rest. Building a loadout can be complicated, which has its own set of positives and negatives. For one, I enjoy a complex FPS, as the market is littered with too many simplistic run-and-gun affairs -- so in some form, I appreciate what Dust 514 is trying to do. 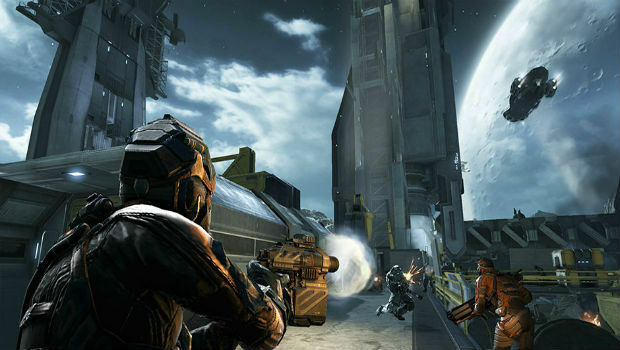 Under the veneer of "kit whatever you can fit" (like the new Black Ops II system), Dust uses an energy rating that essentially allows you to build up whatever you want, and "whatever" consists of hundreds of combinations, ranging from armor pieces, to weapons, to vehicle requests, and much more. You'll also have to balance skillpoints which are basically the bread-and-butter XP system, allowing you to rank up certain skills, increase your character's stats, and unlock new equipment. By the same token, the game is littered with microtransactions, to the point where it feels like it's approaching "pay to win" territory. That isn't to say that the game is pay to win, as there is still a lot of skilled involved with the pure FPS aspect -- but it certainly feels like it. There are two currencies in Dust -- Aurum (real life money), and ISK (money earned by playing the game). In a sense, it's kind of like League of Legend's Riot Points and IP point system, respectively. On paper, it seems to be a fair way to run your game -- but in practice, it's worse than that. The absolute worst example I found during my many hours of play was the fact that you have to constantly spend ISK or Aurum to equip single-use vehicles (or armor) if you want to use some of the more complex and armored options. Yep, that's right, it costs around two to three entire rounds' worth of ISK (or Aurum, if you want to pay for it) to call in a single-use air support vehicle for instance, even if that vehicle crashes and burns in less than a minute. You do get the option to call in a basic truck an infinite number of times (essentially Halo's Warthog), but if you want any of the other (read: better) options, you'll have to wait and grind out your ISK in a painful fashion. While you can technically earn virtually everything to put yourself on an even playing field, you will have to grind to get it, and without a corporation, it won't be nearly as fun. But the fees don't stop there, as many things utilize ISK for a single use. You can buy single-use items like medi-kits, but if you don't want to keep buying them, you have to pay real-life cash in the form of Aurum to get the "blueprints." It goes on from there, complicating the marketplace with combinations of ISK and Aurum transactions side by side, to the point where you'll just ignore the interface entirely if you aren't keen on spending cash. After I realized the needless complexity and sheer audacity of the microtransactions system, I felt incredibly disappointed. I wanted to go into the marketplace section and research items to buy with my ISK, but I kept seeing constant Aurum advertisements popping out. If I accidentally clicked an option for an Aurum package, I had to wait upwards of 10-20 seconds for it to load, advertising the egregious $99.99 option. The game also has "boosters" that net you more experience points, which would have been fine on their own, but feel way too over-saturated when combined with everything else. Dust 514 has promises of greatness. It reaches high and attempts to accomplish something not many games have even tried to this day, which should be commended. But right now, it needs a few more major updates before it gets there. With a hefty amount of microtransactions that border on offensive, there is a very ambitious, competitive game underneath the sloppy veneer.